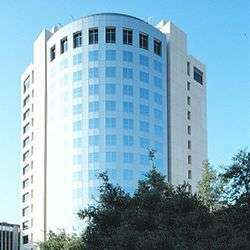 Baylor College of Medicine (BCM), located in the Texas Medical Center in Houston, Texas, US, is a health sciences university. 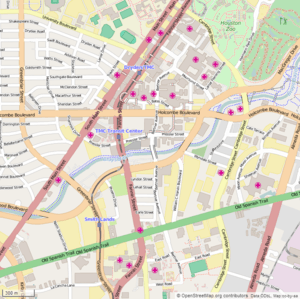 It includes a medical school, Baylor College of Medicine; the Graduate School of Biomedical Sciences; the School of Allied Health Sciences; and the National School of Tropical Medicine. The school, located in the middle of the world's largest medical center, is part owner of Baylor St. Luke's Medical Center, part of the CHI St. Luke's Health system, and has hospital affiliations with: Harris Health System, Texas Children's Hospital, The University of Texas MD Anderson Cancer Center, Memorial Hermann - The Institute for Rehabilitation and Research, Menninger Clinic, the Michael E. DeBakey Veterans Affairs Medical Center and Children's Hospital of San Antonio. The medical school has been consistently considered in the top-tier of programs in the country, and is particularly noted for having the lowest tuition among all private medical schools in the US. Its Graduate School of Biomedical Sciences is among the top 25 graduate schools in the United States. Within the School of Allied Health Sciences, the nurse anesthesia ranks 5th (U.S. News & World Report) and the physician assistant program ranks 6th. A program in Orthotics and Prosthetics began in 2013, with 18 students in the first class. The National School of Tropical Medicine is the only school in the nation dedicated exclusively to patient care, research, education and policy related to neglected tropical diseases. On June 21, 2010, Dr. Paul Klotman was named as the President and CEO of the Baylor College of Medicine. In January 2014, the College and CHI St. Luke's became joint owners of Baylor St. Luke's Medical Center. The school was formed in Dallas, Texas by a small group of Baylor University alumni physicians who aimed to improve medical practice in North Texas. Originally called the University of Dallas Medical Department, the school opened its doors October 30, 1900, with 81 students. Dr. Albert Ferdinand Beddoe, A.B., M.D. was a co-founder. He established the chair of Diseases of Children and became a professor. He built up the free clinic in connection with Baylor hospital. In 1903, an alliance with Baylor University in Waco was formed and the name was changed to Baylor University College of Medicine. By 1918, Baylor University College of Medicine was the only private medical school in Texas. The M.D. Anderson Foundation invited Baylor to join the newly formed Texas Medical Center in Houston in 1943. The school opened in the medical center July 12, 1943, in a converted Sears, Roebuck & Co. warehouse, with 131 students. Four years later, Baylor moved to its present site in the Roy and Lillie Cullen Building, the first building completed in the Texas Medical Center. In 1948, Michael E. DeBakey joined the faculty as chair of the Department of Surgery, and the following year, the Graduate School of Biomedical Sciences was established. Baylor's rise in prominence began in the 1950s when DeBakey's surgical techniques garnered international attention. In the 1960s, the college underwent its first major expansion. In 1969, the college separated from Baylor University and became an independent institution, which allowed it access to federal research funding, changing its name to Baylor College of Medicine. That same year, BCM negotiated with the Texas Legislature to double its class size in order to increase the number of physicians in Texas. In 2005, Baylor College of Medicine began building a hospital and clinic, to be called the Baylor Clinic and Hospital, slated to open in 2011. In 2009, the college postponed construction for financial reasons, with the outer shell of the hospital completed but the interiors remaining unfinished. In March 2012, BCM decided to convert the building to an outpatient clinic center. In 2009, BCM entered into discussions with Rice University regarding a potential merger between the two Houston institutions. After extensive meetings, the boards at both institutions decided that each school would remain an independent. In 2010, Baylor University entered into talks with BCM to strengthening ties to each other; however, the merger did not occur. In January 2014, the BCM and CHI St. Luke's announced they would become joint owners of Baylor St. Luke's Medical Center, a hospital at the Texas Medical Center (formerly known as St. Luke's Episcopal Hospital, then St. Luke's Medical Center after it was purchased by Catholic Health Initiatives in 2013). A partially completed hospital building on the BCM-McNair Campus is slated to open in 2015 and will become BCM's acute care hospital and main medical teaching facility. Each year the medical school matriculates around 185 students, around 75% of whom are Texas residents. Baylor College of Medicine is the least expensive private medical school in the country. It is also one of the few medical schools in the United States that is structured with an accelerated 1.5 year preclinical curriculum (the others are Columbia University College of Physicians and Surgeons in New York City, the University of North Carolina School of Medicine in Chapel Hill, North Carolina, the University of Pennsylvania School of Medicine in Philadelphia, Pennsylvania, University of Virginia School of Medicine, Emory University School of Medicine in Atlanta, Georgia, and University of Texas Health Science Center at San Antonio in San Antonio, Texas). Baylor College of Medicine is also one of only 45 medical institutions in the United States to offer a Medical Scientist Training Program. This federally sponsored and highly competitive program allows exceptionally well qualified students to study for a combined MD and PhD in a medical science to be earned in 7–9 total years. Typically, 8–12 students matriculate into this program per year, and receive free tuition in addition to a stipend of $29,000 per academic year. The Baylor College of Medicine Graduate School of Biomedical Sciences ranks 25th for best Ph.D. program in the biological sciences. Overall, in 2013 BCM ranked 19th in terms of research funding from the National Institutes of Health based on rankings done by the Blue Ridge Institute. Baylor also ranked in the top 20 in eight specialty areas, including number one in the nation for Genetics. BCM's research faculty includes seven members of the National Academy of Sciences, 14 members of the Institute of Medicine and three members of the Howard Hughes Medical Institute. About 100 students join the graduate program each year, of which one half were women and one third were graduates from foreign schools. Baylor College of Medicine School of Allied Health Sciences is focused on educating allied health professionals to be leaders in the delivery of high-quality patient care; advancing the knowledge of allied health education, healthcare delivery, and health promotion through research; fostering healthy lifestyles among adults and children through innovative health education programs; and augmenting patient care services provided through Baylor College of Medicine and our affiliated hospitals. The School's Physician Assistant Program which began in 1971 as a certificate program, was elevated to Bachelor of Science status in 1975, and on to a Master of Science program in 1989. Today, this program ranks 6th among the nation’s physician assistant programs according to U.S. News & World Report. The 2012 graduates of the Graduate Program in Nurse Anesthesia Program were the first to earn their doctorate of nursing practice from the Program. Developed from a 1968 a certificate program that was offered by the Harris County Hospital District, now the Harris Health System, in 1983, it became a Master of Science degree program under the auspices of Baylor. This program ranks 5th in the nation among training programs in nurse anesthesia according to U.S. News & World Report. The Master of Orthotics and Prosthetics Program welcomed its first students in June 2013. It is a 30-month program, where the first 12 months are dedicated to the didactic curriculum, and the following 18 months are spent on clinical rotations and research. It Is the only program in the country to integrate a series of full-time clinical rotations exposing students to six core areas of expertise designed to meet the requirements of the NCOPE-approved residency. Baylor College of Medicine National School of Tropical Medicine is one of the first of its kind in North America devoted to education, healthcare delivery, research and policy related to the neglected diseases that disproportionately afflict "the bottom billion," the world's poorest people who live below the World Bank poverty level. The School currently offers a Diploma in Tropical Medicine program as well as several non-degree courses and seminars for undergraduates, graduate students and professionals. Plans are in development for masters and doctorate programs. The School provides clinical services at the Tropical Medicine Clinic at Harris Health System's Smith Clinic, which opened on October 6, 2011. The mission of the Clinic is to prevent, diagnose, and treat common and neglected tropical diseases in the Houston metropolitan population and to improve occupational health for those working in regions where tropical diseases thrive. Baylor Travel Medicine, an affiliate of the National School of Tropical Medicine, opened in May 10, 2012, offers medications, immunizations, counseling, and information customized for each patient’s health needs. The National School of Tropical Medicine also conducts a comprehensive research and development program for producing a new generation of drugs, diagnostics and vaccines for the Neglected Tropical Diseases (NTDs) and Neglected Infections of Poverty (NIoPs), as well as fundamental and applied research against these diseases. The Bobby R. Alford Department of Otolaryngology – Head and Neck Surgery strives to provide its medical students, residents and fellows with the highest quality education. They seek to teach their trainees to become outstanding clinicians and surgeons, to understand basic, translational and clinical research and to develop their teaching skills. They have trained residents and fellows for more than 50 years, and their graduates are active in both academic medicine and private practice. The Otolaryngology department has strong ties to the local hospitals and medical centers in the Houston area. Their biggest partnership is with the Texas Medical Center where they are able to offer their students an Otolaryngology Residency  or Pediatric Fellowship at a number of different hospitals, depeding on what field you are interested in pursuing. The Bobby R. Alford Department of Otolaryngology – Head and Neck Surgery has a strong tradition of biomedical research in the areas of the special senses and other organ systems of the head and neck. Head and neck cancer is also a focus, particularly immunotherapy and HPV-related cancers. Basic, clinical, and translational projects in these areas are ongoing, and support for these projects comes from a variety of sources including competitive awards from the NIH and research foundations. Clinical research is conducted in all fields of otolaryngology, including facial plastic and reconstructive surgery, hearing and balance disorders, head and neck cancer, laryngology, rhinology and allergy and pediatric otolaryngology. Andrew Sikora Lab  - The Andrew Sikor Lab is researching how cancer and cancer therapies interact with the immune system, and translating these insights into novel therapies for patients with head and neck cancer, melanoma, and other cancer types. They are also investigating the biology of viral (HPV-related) and non-viral (tobacco/alcohol-related) head and neck cancers, and exploiting this information to develop biomarkers of cancer risk, prognosis and treatment response. Center for Balance Disorders Vestibular Function Laboratory - The Center for Balance Disorders Vestibular Function Laboratory studies mechanisms of vestibular compensation and visual-vestibular interaction important to maintenance of balance and coordination. Cochlear Biophysics Laboratory - The Cochlear Biophysics Laboratory researches the electro-motility, structure, electrochemical gradients, lipid composition and transmembrane potential of outer hair cells, vital to hearing. Institute for Voice and Swallowing Laboratory - The Institute for Voice and Swallowing Laboratory is focusing on a spectrum of basic and applied science projects addressing cutting-edge concepts in laryngology. We are also engaging in population-based studies and models for improving patient outcomes through comparative effectiveness research. The Baylor Otolaryngology Clinic treats allergic and nonallergic nasal and sinus disorders, disorders of sleep, malignant and benign tumors of the head and neck, thyroid and parathyroid surgery, vocal and airway disorders, and offers facial plastic and reconstructive surgery and general otolaryngology services. The Center for Hearing and Balance is an interdisciplinary group of physicians, surgeons and supportive medical specialists who take a comprehensive approach to patients with these problems. Programs are designed to address chronic ear disease, audiology and hearing evaluations, hearing augmentation and rehabilitation, balance disorders and lateral skull base tumors. The Sinus Center at Baylor College of Medicine offers advanced care for patients with sinusitis, nasal polyposis, fungal sinusitis, nasal congestion and tumors of the nasal cavity and skull base. Minimally invasive and computer-assisted surgical techniques are available for patients with refractory or complex nasal and sinus disease. The Baylor Facial Plastic Surgery Center provides a wide range of surgical and non-surgical procedures for the cosmetic, reconstructive and medical enhancement of the face and neck. The Institute for Voice and Swallowing at Baylor College of Medicine offers a comprehensive interdisciplinary approach to voice and swallowing disorders, bringing advanced care to patients with a foundation of basic and applied research. Our programs in the areas of professional voice, interventional laryngology, dysphagia, cough and airway are also the framework for education to help promote a new definition of best practice in the community. The Center for Dysphagia and Swallowing Disorders provides a comprehensive, multidisciplinary approach with a team of otolaryngologists, thoracic surgeons, gastroenterologists, radiologists, speech therapists and nutritionists to evaluate and treat patients who have difficulty swallowing food or liquids. Baylor College of Medicine pediatricians care for patients with head and neck conditions in the Texas Children's Ear, Nose and Throat (Otolaryngology) Clinic. Baylor College of Medicine sponsors Graduate Medical Education in more than 80 ACGME-accredited, and 40 Texas Medical Board (TMB)-approved training programs. At Baylor College of Medicine residents and fellows learn from one of the most diverse patient populations anywhere in the country. This is partially due to the diversity found within the city of Houston, which has no single majority ethnic group. The hospitals of the Texas Medical Center and Houston's status as a hub for international industry also draw patients from every corner of the globe. Adding to this diversity are the many and varied settings in which residents and fellows have the opportunity to train, including Baylor St. Luke's Medical Center and Baylor's many affiliated hospitals. In 2013, Baylor College of Medicine ranked 19th in terms of research funding from the National Institutes of Health based on rankings done by the Blue Ridge Institute,. Baylor also ranked in the top 20 in eight specialty areas, including number one in the nation for Genetics. BCM is a co-owner of Baylor St. Luke's Medical Center, part of CHI St. Luke's Health. It serves as the primary private adult teaching hospital for the College and ranks among the best hospitals in the nation for cardiology and heart surgery, diabetes and endocrinology, gastroenterology and GI surgery, and pulmonology in U.S. News & World Report. The Baylor International Pediatric AIDS Initiative (BIPAI) at Baylor College of Medicine and Texas Children's Hospital was established in 1996, and has rapidly become the world's largest university-based program dedicated to global pediatric and family HIV/AIDS care and treatment, health professional training and clinical research. Baylor constructed and opened the world's two largest centers for the care and treatment of HIV-infected children and families, the Romanian-American Children's Center in Constanta, Romania in 2001, and the Botswana-Baylor Children's Clinical Center of Excellence in Gaborone, Botswana in 2003, followed by Uganda, Lesotho, Swaziland, Malawi, and Tanzania, where it has entered into partnership with the Ministries of Health to scale up pediatric HIV/AIDS care and treatment, and build and open new Children's Clinical Centers of Excellence. BIPAI also has created the Pediatric AIDS Corps, a model program to place up to 250 American pediatricians and infectious disease specialists in its African centers to vastly expand capacity for pediatric HIV/AIDS care and treatment and health professional training. Major funders of BIPAI's activities include NIH, Centers for Disease Control and Prevention (CDC), the Bristol-Myers Squibb Foundation, Abbott Laboratories, and numerous private and corporate foundations. Arthur L. Beaudet, M.D. — Professor of Molecular and Human Genetics, and a member of the National Academy of Sciences. John Barnhill — Chief of the Consultation-Liaison Service at New York-Presbyterian Hospital/Weill Cornell Medical Center. Albert Ferdinand Beddoe, A.B. M.D. - co-founder. Robert Earl Beddoe, M.D. matriculated 1904, Medical missionary to China 1909 - 1947. Hugo J. Bellen — noted developmental biologist; Howard Hughes Medical Institute investigator. C. Thomas Caskey — American internist and prominent medical geneticist and biomedical entrepreneur. Clay J. Cockerell, professor of clinical studies at University of Texas Southwestern Medical Center. Denton Cooley — founder of the Texas Heart Institute and world-renowned cardiovascular surgeon. Carried out the first successful implantation of an artificial heart. Charles Fraser (surgeon), M.D. — Professor and Chief of Congenital Heart Surgery Division, BCM. Surgeon-in-Chief of Texas Children's Hospital, and Director of the Adult Congenital Heart Surgery Program at the Texas Heart Institute. O. H. Frazier — Heart surgeon who has performed over 1,000 transplants. Richard A. Gibbs, PhD — pioneering geneticist. Leslie A. Geddes, PhD — PhD, pioneering biomedical engineer and inventor. Paul Randall Harrington — inventor of the Harrington Rod, a device used to treat scoliosis. David C. Hilmers — Former astronaut and current professor of medicine and pediatrics. Peter H. Lin, M.D. — Professor Emeritus of Surgery; Former Chief of Vascular Surgery, BCM; Pioneer in minimally invasive treatment of vascular disease. James Lovelock — Former professor, chemist, proponent of Gaia hypothesis. Huntly D. Millar — founder and owner of Millar Instruments, Inc., worldwide distributor of catheter-tip pressure sensors. C. Kent Osborne, MD — Director, Dan L. Duncan Cancer Center. David Poplack, MD — Director, Texas Children's Cancer Center, Professor of Pediatrics. Lorraine Potocki, M.D. — Medical Geneticist and researcher, co-discoverer of the genetic disorder Potocki-Lupski syndrome (PTLS). Sishir Rao, M.D. ; Co-Founder of the Indian Heart Association and physician at Harvard Medical School/Massachusetts General Hospital. Michael J. Reardon — Internationally known heart surgeon who developed first successful cardiac auto transplantation for cardiac sarcoma. Peter G. Traber — President Emeritus of Baylor College of Medicine. Huda Zoghbi — Member of National Academy of Sciences; Investigator of Howard Hughes Medical Institute; Award-winning neuropsychiatrist; Director of Jan and Duncan Neurological Research Institute, Houston, Texas. The male Asian elephant calf born to Shanti at the Houston Zoo on May 4, 2010 was named Baylor in honor of the college and their research on elephant herpesvirus. ↑ "Archived copy". Archived from the original on 2013-01-15. Retrieved 2013-02-02. ↑ Klotman named president of Baylor College of Medicine - Baylor College of Medicine, Houston, Texas Archived June 7, 2011, at the Wayback Machine. ↑ Morrissey, Charles T. "Baylor College of Medicine". Handbook of Texas Online. Texas State Historical Association. Retrieved 2016-09-05. ↑ BCM History - Baylor College of Medicine - Houston, Texas Archived December 13, 2013, at the Wayback Machine. ↑ Acceptance and Funding - Medical Scientist Training Program - Baylor College of Medicine, Houston, Texas Archived July 19, 2011, at the Wayback Machine. ↑ "eaudet named to National Academy of Sciences". Baylor College of Medicine. Archived from the original on 14 May 2011. Retrieved 2011-05-20. ↑ Malislow, Craig. "Out of Hand." Houston Press. Wednesday October 26, 2011. 2. Retrieved on November 20, 2011. ↑ "Dr. Feigin Biography". Texas Children's Hospital. Archived from the original on March 17, 2007. ↑ "O.H. Frazier, M.D.". Houston Chronicle. Retrieved 2008-12-22. ↑ "Roger Guillemin - Autobiography". The Nobel Foundation. 1977. Archived from the original on 4 May 2007. Retrieved 2007-03-31. ↑ "David C. Hilmers Biography". Baylor College of Medicine. Archived from the original on 2010-05-29. ↑ "Carolyn L. Huntoon". energy.gov. Retrieved November 30, 2013. ↑ Templeton, David (2008-08-29). "Pitt graduate given highest science honor in the U.S.". Pittsburgh Post-Gazette. Retrieved 2008-08-29. ↑ "Dr. C. Kent Osborne Biography". Baylor College of Medicine. ↑ "Dr. David Poplack Biography". Texas Children's Cancer Center. ↑ "BCM Dept. of Molecular and Human Genetics: Potocki-Lupski Syndrome". Baylor College of Medicine. Archived from the original on 2011-06-07. Retrieved 2010-12-11. ↑ "Andrew V. Schally - Autobiography". The Nobel Foundation. 1977. Archived from the original on 4 May 2007. Retrieved 2007-03-31. ↑ "Peter G. Traber, M.D.". Baylor College of Medicine. Archived from the original on 12 March 2007. Retrieved 2007-04-06.